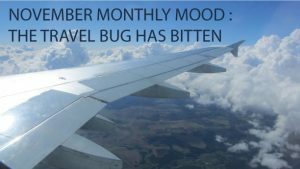 We were bitten by the travel bug this year and as many of you know we spent three weeks in Europe during September/October. You would think all the traveling would have us tired and glad to be home, which we certainly are, but that doesn’t mean we aren’t already dreaming of other places to visit or dreaming of returning to some of the places we just were (you can never visit Paris too many time!). Image taken while flying from Dublin to Paris as we came in to land in Paris. That being said this month we are going to focus on traveling. We plan to share some details of our trip. We will be featuring posts about our time in Dublin, Ireland and Paris, France (where we got engaged!). We will also be sharing some travel tips with you. We became experts at packing light, which is something you want to do for a large trip where you will be on the move a lot. Once you have packed light for a large trip you will see how much lighter you pack for a weekend away too. Packing light really is life changing when traveling and I promise you will never want to over pack again. We will also share with you some tips for planning that big trip and let you in on how we did it. I have been to Europe twice, once for a month and this last 3 week trip. Both trips we planned completely on our own and both trips went flawlessly. We will share some tips on how you can do the same. We will be sharing tips for traveling with others, this goes with the planning process to make sure everyone gets what they want out of the trip. This can also be applied to combing styles and personalities when decorating your space. So as you can see we have lots in store for you this month. We will be back to posting on our regular schedule of Tuesdays and Thursdays. The only day we will miss this Month is Thanksgiving, as you all know we believe that is a time to spend with family and friends and will be taking the entire long weekend off to do just that.